Champion Express (continued from page 21) thrust of 4,000 pounds. The steer- ing system is by SSI. The vessel's capacities include 44,000 gallons of fuel oil, 12,000 gallons of potable water, 132,000 gallons of ballast water, 3,000 cu- bic feet of dry mud, and 1,500 bar- rels of liquid mud. The cargo deck area measures 96 by 28 feet. Ac- commodations are provided for 17 persons. Launch & Tug Company of Seat- tle, was commissioned during 1983. 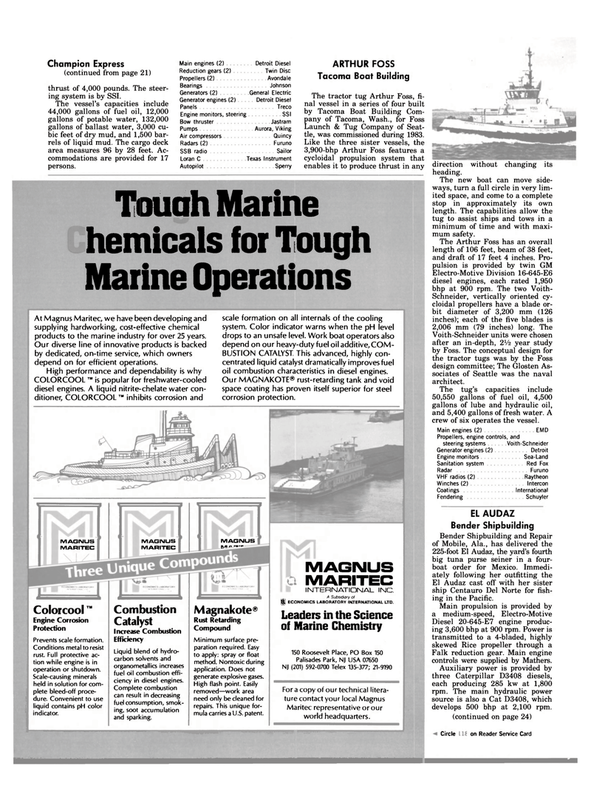 At Magnus Maritec, we have been developing and supplying hardworking, cost-effective chemical products to the marine industry for over 25 years. Our diverse line of innovative products is backed by dedicated, on-time service, which owners depend on for efficient operations. BUSTION CATALYST. This advanced, highly con- centrated liquid catalyst dramatically improves fuel oil combustion characteristics in diesel engines. Our MAGNAKOTE® rust-retarding tank and void space coating has proven itself superior for steel corrosion protection. direction without changing its heading. The new boat can move side- ways, turn a full circle in very lim- ited space, and come to a complete stop in approximately its own length. The capabilities allow the tug to assist ships and tows in a minimum of time and with maxi- mum safety. Voith-Schneider units were chosen after an in-depth, 2Vfe year study by Foss. The conceptual design for the tractor tugs was by the Foss design committee; The Glosten As- sociates of Seattle was the naval architect. The tug's capacities include 50,550 gallons of fuel oil, 4,500 gallons of lube and hydraulic oil, and 5,400 gallons of fresh water. A crew of six operates the vessel. El Audaz cast off with her sister ship Centauro Del Norte for fish- ing in the Pacific. Falk reduction gear. Main engine controls were supplied by Mathers. Conditions metal to resist rust. Full protective ac- tion while engine is in operation or shutdown. Scale-causing minerals held in solution for com- plete bleed-off proce- dure. Convenient to use liquid contains pH color indicator. Liquid blend of hydro- carbon solvents and organometallics increases fuel oil combustion effi- ciency in diesel engines. Complete combustion can result in decreasing fuel consumption, smok- ing, soot accumulation and sparking. Minimum surface pre- paration required. Easy to apply: spray or float method. Nontoxic during application. Does not generate explosive gases. High flash point. Easily removed—work area need only be cleaned for repairs. This unique for- mula carries a U.S. patent. H) ECONOMICS LABORATORY INTERNATIONAL LTD.
Maritec representative or our world headquarters.